Water purification station: Water = Drinking water? The station represents a basic logic function of water treatment in the form of a water storage system with an overflow rim. A groundwater tank with a submersible pump is required for operation. The training documents reveal how a flocculation reaction is implemented by adding a flocculant, and how sedimentation can occur in spite of the flow. Chlorine is used worldwide to preserve drinking water. Over-metering not only increases the plant operator's costs unnecessarily, it also pollutes the environment and endangers the consumers. The additional chlorine measurement package with manual metering technology is a 1:1 training scenario for online chlorine measurement. This allows you to learn how to operate a chlorine metering system, and react to malfunctions and optimize the system. The station is fully assembled, wired and tested. 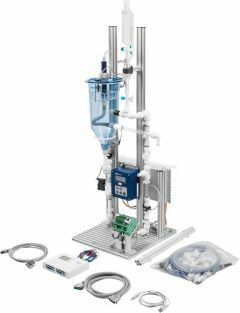 Including control system with FluidLab®-EDS® Water Management, EasyPort, connecting cables, accessory set and "Getting Started" technical documentation. 3 l tank, including an overflow rim, capacitive proximity sensor, float switch, impeller flow sensor, pressure sensor , 2/2-way solenoid valve, non-return valve, electric connection board, aluminum profile plate. For single operation, a water supply tank/ground water (order no. 8024503) is required.